Have you ever had a surprise on your water bill when your water usage went up? The problem with starting or changing your irrigation system isn’t that you’re not expecting the amount to change… it’s that it takes 2 months before you know the effects of any changes. The city reads your meter electronically around the 20th of each month, which covers the usage since the 20th of the month before. But the water bill for that reading doesn’t get generated until the 21st of the following month. So let’s say you bump up your irrigation system the last week of June. The increased water usage will be read by the city on July 20th, and you won’t see it until you receive the bill in late August, usually the 23rd to the 26th – about 8 weeks after you made the change. Here’s how to predict your water bill a month in advance — reading your own water meter when the city does! First, set a reminder on your favorite calendar or reminder application to “Read Water Meter” on the 20th of every month. Then, when the reminder goes off, go outside to your water meter, lift the cover gently and move it to the side. You’ll note there are some wires going up from the actual meter to the cover… so don’t move it far. Those wires run to a small antenna that sends the meter reading to the water utility truck that drives through your neighborhood on the meter reading day. Inside, if you haven’t read your water meter in some time, you might have to wipe some dirt off of the actual water gauge. Take along a moist paper towel or a soft cloth, and wipe gently across the face of the dial. You should see something like the picture. You’ll see a set of 4 digits that are black-on-white, followed by 3 digits that are white-on-black. The first four digits are the important ones: those represent “thousands of gallons of water used since the meter was installed.” Here, it reads 632 (ignore the leading zeros). Normally I’ll just take my cell phone and snap a quick picture, then carefully put the cover back on (remember to be careful of the wires underneath). With that reading and my June water bill (the one I received Saturday June 24), I can predict my July water bill! Remember that the bill includes water, sewer, and garbage fees, plus some other small fees and taxes. Below the base fee line on your bill you’ll see Tier 1 Fees for a maximum of 4,00 gallons, which are billed at $1.15 each 1,000 gallons. If you use more than 4,000 gallons, then the next Tier shows up, with a charge of $1.83 per 1,000 gallons, up to another 4,000 gallons of water. If you use no more than 8,000 gallons, you should only see two tiers. Otherwise, you’ll see Tier 3, which costs $2.68 per 1,000 gallons up to another 4,000 gallons (12,000 gallons total). If you use more than 12,000 gallons, you’ll see Tier 4, at $4.20 per 1,000 gallons over the Tier 1-3 usage. Since my most recent bill was for 7,000 gallons (see the Consumption column in the table) and my consumption for the July bill will the 8,000 gallons, I know my water bill will go up $1.83, plus a little bit perhaps in taxes. 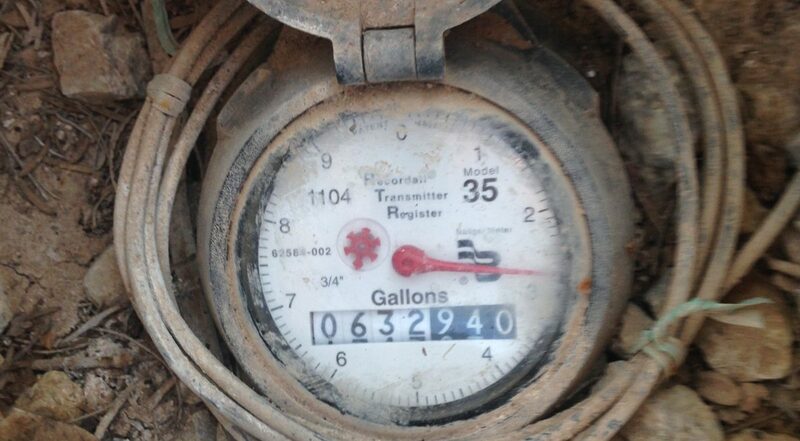 It’s possible, of course, for your reading of the meter to not match the water bill, but it should only be off by 1,000 gallons – depending on what time you read the bill and what time the city read the bill. Since they don’t read the white-on-black digits, it’s common for your water bill to vary a little every month or so, even if your actual consumption is pretty even. If you really want to watch your water consumption more carefully, set a day of each week — Saturday or Sunday — then read your meter weekly, recording and observing changes. If you do this, be sure to read all the digits of your meter (or of your picture of the meter, as I recommended). Note that the last “units” digit on the meter does not move… it’s always zero! But the large red needle points to the amount of water for the units position (number around the edge of the meter), and actually indicates a fairly precise amount of water at a tenth of a gallon (about a cup and a half!). If you have water flowing when you’re looking at your meter, you’ll see the large red needle moving (slowly, hopefully) and the little red multi-point wheel to the left of it twirling around. Want to know how much water your irrigation system uses every 10 minutes? Make sure no water is being used (no showers, dishwashers, washing machines, etc. 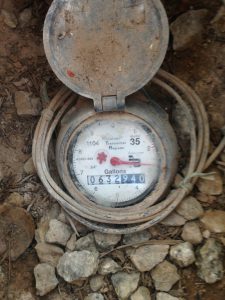 ), read your meter (as accurately as you can, down to the tenth of a gallon), fire up your irrigation system for 10 minutes, and read your meter again. The difference should be your irrigation water usage. You can use the same approach to see how much water your other appliances use, etc., but it’s a little more difficult to stop everyone from using other water while you’re doing that! Still, now you should have a pretty good idea how your water usage can be monitored. So your sewer bill may go up or down, depending on how your “winter usage” for this past winter compared to your winter usage from the year before. First they’ll ask you to verify that all water is turned off in the house: no dishwashers or washing machines running, no showers, nobody use the bathroom (just for a couple of minutes). Then they’ll read the meter exactly, or possibly mark where the red needle is pointing. Using a 5-gallon bucket, they’ll run exactly 5 gallons of water into it from your garden hose. Lastly, they’ll look at the red needle. It should have measured 5 gallons exactly. I know some people don’t use their irrigation system. But if you do, you should be taking a look at it at least once a month or so, and making seasonal adjustments. More water in the summer, less in the spring and fall, and even less in the winter. Your Hunter irrigation system has a seasonable adjustment feature. If you’re interested in learning more about the irrigation system, let me know.